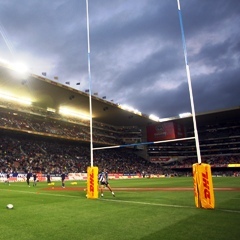 Cape Town - The Congress of South African Trade Unions (Cosatu) may still go ahead with their threat to picket Saturday's Rugby Championship match between the Springboks and All Blacks at Newlands. The trade union, who are demanding that all Springbok matches be broadcast on SABC and not exclusively on DSTV, met with both SA Rugby and DSTV as well as Minister of Sport, Thembelani Nxesi, on Thursday - but no compromise could be reached. In a statement released to the press, Cosatu confirmed that all parties will meet again on Friday to try to resolve the issue, but that if nothing changes, they will picket Newlands on Saturday. On Wednesday, Cosatu also called for SuperSport to drop rugby pundits Naas Botha and Nick Mallett stating that, "the commentators like Naas Botha and Nick Mallett are outdated and should be replaced. Nick Mallett also has a habit of promoting white players and talking black players down, because he suits the Stellenbosch mafia’s agenda. Mallett should be removed for this racism and clear unbiased reporting of the game."